The lemon pudding recipe follows the Leon principle that what tastes good can also do you good, many of the recipes in the book are sugar, dairy, wheat or gluten free—so there's plenty to enjoy even if you have a food allergy, intolerance or watching your weight. This recipe was, apparently, one that Henry’s great granny Enid handed down to his mother. 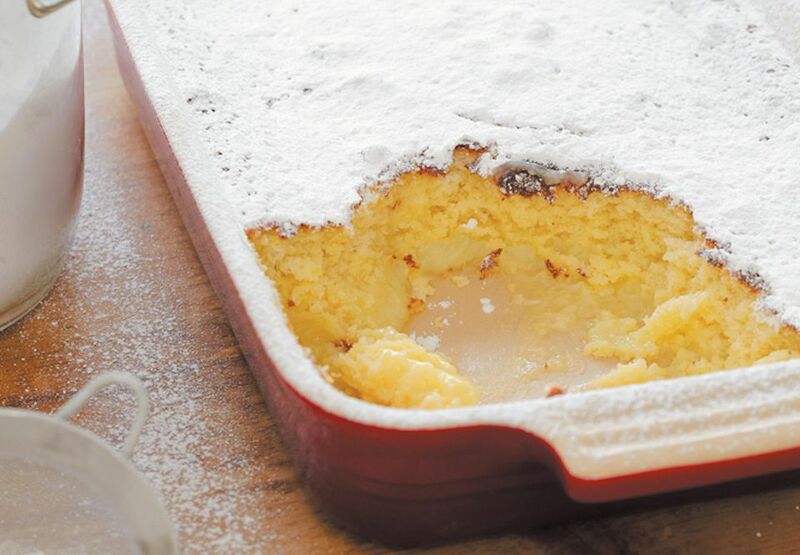 It was cut out from a newspaper and was called ‘Lemon Pudding’—next to it Enid had written ‘delicious!’ Try the recipe and we think you will agree. It is now one of our favorites. Here's a secret, we know it makes it rich but we love this with a little clotted cream. Heat the oven to 350 F/180 C gas mark 4 and place a roasting tin half-filled with water on the centre shelf to warm up. Butter a 1.5–1.75-litre soufflé or similar ovenproof dish. Whisk the butter in a large bowl until soft, then add the sugar and whisk until fluffy. Gradually whisk in the lemon juice, followed by the grated lemon zest and the egg yolks. Sift the flour on to the mixture and stir it in with a metal spoon, then gradually stir in the milk. Whisk thoroughly until very smooth. In a clean bowl, whisk the egg whites with the cream of tartar using an electric hand mixer until they stand in soft peaks. Then, using a metal spoon, fold them gently into the pudding mixture, about a quarter at a time. Pour the mixture into the soufflé dish and stand it in the roasting tin of water in the oven. Bake for 40 minutes, or slightly less in a fan oven, until risen and golden brown on top. Serve hot or cold, with a little icing sugar sifted over the surface if you like. We serve this pudding with a good dollop of vanilla ice cream, or you may want a light pouring of cream if you prefer. rest assured though, the pudding is absolutely delicious on it's own. When served warm the pudding will be slightly wobbly and creamy, it sets more firmly once it is left to go cold.